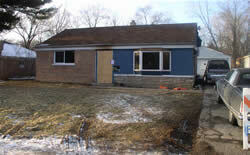 HomeLaw and OrderLocal Police ReportsPossible Arson/Suicide on Monee Rd. Possible Arson/Suicide on Monee Rd. Park Forest, IL–(ENEWSPF)– Park Forest police released a statement Friday regarding a possible arson/suicide early Friday morning. On January 19, 2007, shortly after 1:30 in the morning, police were investigating a report of gun shots in the area of Monee and Western. Investigating patrol units observed that the single family home located at 8 Monee Rd. was engulfed in flames. Park Forest Fire Department units responded and suppressed the house fire. A deceased male white body was located in the living room immediately inside the front door. The Park Forest P.D. Arson Investigation Unit responded and found evidence of accelerants at three separate points of origin throughout the house. The fire does not appear to be accidental. The State of Illinois Fire Marshall's Office and the Cook County Sherriff's Police Department Crime Scene Unit responded at the request of PFPD Detectives. The preliminary investigation is showing the incident to be a possible Arson / Suicide. The deceased is tentatively identified as the sole occupant of that address, a 42 year old white male. Hand written documents recovered at the scene and interviews with friends of the deceased, are revealing that he was depressed in reference to recent personal struggles. The remains were transported to the Cook County Medical Examiner's Office for a post mortem examination. Police stress this information is preliminary information and should not be construed as final. The Park Forest Police Department Investigations Unit will actively pursue completion of this investigation in the near future. eNews Park Forest will report as more information becomes available.